Imagine if we could be like plants, lying outside all day soaking up sweet, sweet energy from the sun. Doesn’t sound like a bad life, does it? So why aren’t the world’s best minds figuring out how to hack photosynthesis into humans? It turns out there are a lot of reasons, which are spelled out in a new video by the American Chemical Society. First, there are aesthetics to consider: your cells would have to be packed with light-harvesting pigments called chlorophyll, meaning you’d be bright green, or maybe a custom-tailored shade of red or blue. (Although I’m pretty sure you wouldn’t have ivy sprouting out of your forehead.) But far more problematic than your skin’s unusual hue is the energetics of photosynthesis. Finally, plants maximize the amount of energy they can capture by growing their leaves very thin. Your sausage fingers and burrito arms are ill suited for the task, so you’d probably want to scrap them for bionic sail appendages instead. Is this sounding fun or what! 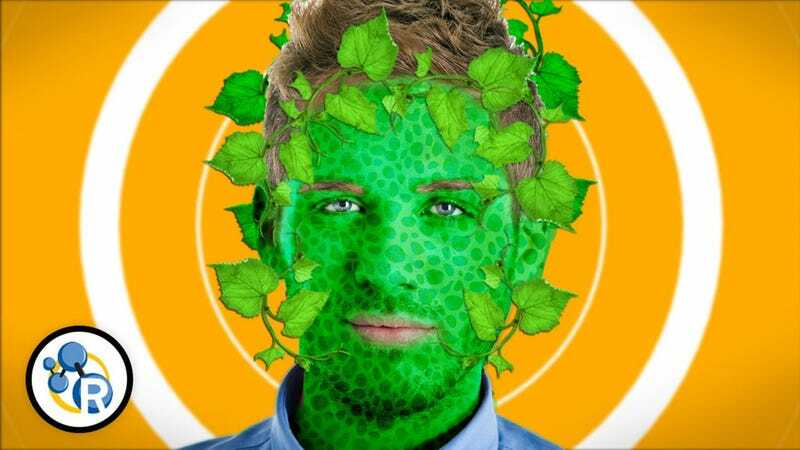 Insurmountable obstacles aside, the idea of hacking photosynthesis into humans has gotten real scientific consideration, and there are animals out there that really do photosynthesize, in a way. So, even though our descendants will never live entirely off the sun, who knows? Maybe distance runners of the future will be able to charge up with a little solar snack now and again.